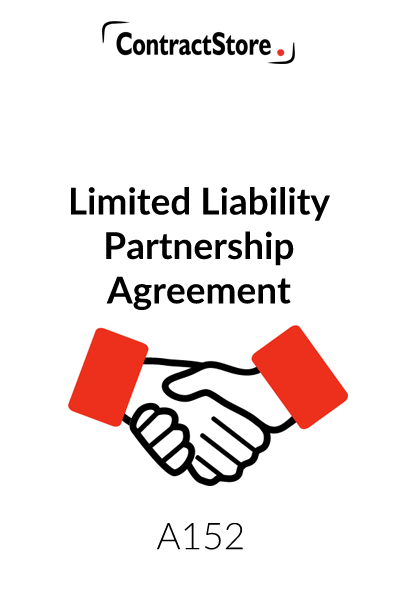 Any individuals or companies establishing a limited liability partnership will need an LLP agreement. It is written for 3 or more partners. What is this LLP Agreement for? A limited liability partnership is similar to a general partnership in many respects. 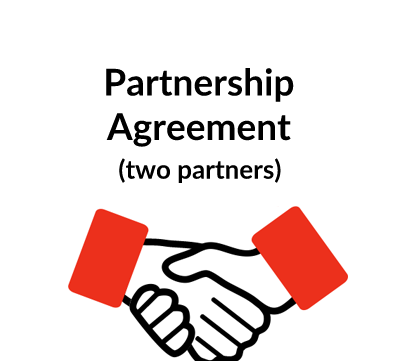 Each partner or ‘member’ is an owner and receives a share of profits. Unlike a limited company, the LLP does not pay tax, this is paid by each member on their profit share. But as with a limited company, the liability of the members is limited. The Business. The nature of the business will be identified as well as the name. Capital contributions and profit shares. These will be set out in the agreement or in an attached schedule. The duties of the members to contribute additional capital may also be included. 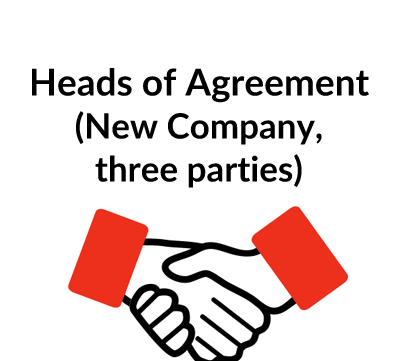 As with the general partnership, the members are not employees and instead they will draw income from the business on account of their share of profits. The LLP agreement sets out the rules, including what happens if there isn’t enough money to pay them all. Designated members. At least two members have to be identified on the Companies House register as “designated members” – i.e. the members responsible for filing returns at Companies House. Governance and management. The LLP agreement will say how decisions are arrived at – the voting rights of each member and whether all or only some decisions will require unanimity or a special majority. More routine matters such as holidays, sick pay etc. should also be dealt with. Introduction of new members, retirement and expulsion. The procedure for appointing new members as well as notice periods for retirement and payment of capital and profits to outgoing members will be set out. 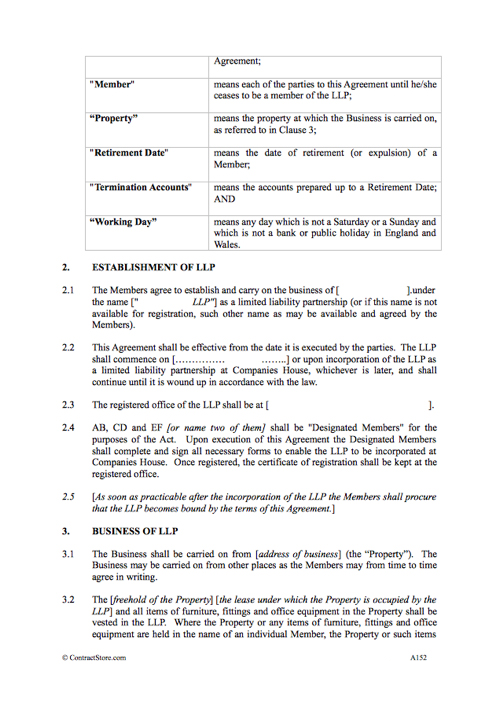 What detailed terms does the LLP Agreement contain? Limited Liability Partnerships were introduced in the UK by the Limited Liability Partnerships Act 2000. A limited liability partnership (LLP) established under the Act has a separate legal personality apart from its members – in the same way as a limited company does and the liability of the members is limited. For taxation purposes, however, the members are taxed as individuals, just as they are under a general partnership. While a general partnership can be formed by individuals (or companies) without any formal documentation being available on a public register, an LLP has to be registered at Companies House and the details of the LLP – names and addresses of members – i.e. the partners, a copy of the incorporation documents and annual accounts are all available for public inspection. However, the LLP Agreement is a private agreement and does not have to be filed at Companies House. Although LLPs in theory confer limited liability on the business, there are some potential exceptions – in particular an individual member might still be held liable for negligence in certain circumstances. For more detail on LLPs see our notes on this subject on our website. Turning to the form of agreement, this draft is designed for an LLP to be formed between three individuals. It can easily be adapted to cater for more than three members. The date to be inserted on the first line is the date on which the Agreement is signed by the parties. The name and normal residential address of each party should be inserted here. This briefly describes the fact that the parties wish to establish a new business in the form of a limited liability partnership. Accounting Year – the date on which the accounting year that the LLP ends needs to be inserted. This is one of the statutory requirements. The date to which the accounts will be made up is the ‘accounting reference date’ and this needs to be notified to Companies House. Accountants – the name of the first accountants or auditors of the LLP should be inserted. There is no need for auditors if the income of the LLP is below a certain amount and in that case the word ‘accountants’ may be used instead of auditors. It is a legal requirement that annual accounts of the LLP are filed at Companies House. Authority – Where the LLP is governed by a professional body – e.g. it is subject to regulatory control by the FSA (Financial Services Authority) or a professional body such as the Institute of Chartered Accountants or the Law Society, the name of the authority should be inserted here. Interest Rate – this is the rate of interest applying to various terms in the Agreement – e.g. a payment of any money that is due from a member to the LLP and, unless otherwise agreed, interest which is due on a loan from a member to the LLP. The rate and the name of the bank which is relevant for calculating the interest rate should both be inserted. As will be seen, clause 2.1 needs to have a brief description of the business and the proposed name of the business inserted. The name must be cleared with Companies House and it must also have the letters “LLP” or “Limited Liability Partnership” as part of the name. The agreement can be effective from the date it is signed by the members, but the LLP can only commence trading once it has been incorporated – hence the wording of this Clause. It is necessary for an LLP to have a registered office – i.e. the official address of the LLP to which formal notices must be sent and this should be inserted here. Under clause 2.4 we refer to “Designated Members”. This is a phrase used in the Act and the designated members are the people who are authorised to sign all formal documentation in relation to the LLP. There must be at least two Designated Members and there is nothing to prevent all the members having this role. Under clause 2.5, since the LLP is a legal entity separate from the individual members, it may be sensible to have a resolution of the LLP after it has been formed under which the LLP agrees to be bound by the terms of this agreement. This is not essential but it can be good practice to include such a provision. This clause contains some information in clause 3.1 on the main office of the business – which may be different from the registered office. Where one of the members is providing premises and/or office equipment etc. which are occupied/used by the LLP, clause 3.2 will be relevant. Similarly, any other special terms relating to the conduct of the business should be set out in this clause. There are no specific legal requirements as to the amount of the initial capital and whatever the figure is should be inserted in clause 4.1. The capital will be contributed by the members in the proportions in which they are entitled to the capital – e.g. one third each. It is usual for the members to contribute any future capital in the same percentages as their initial capital and this is covered by clause 4.2. Under clause 4.3, the agreement makes it clear that no interest will be payable to the members on their capital contributions. Clause 4.4 deals with the possibility of additional capital. The Clause provides that this will preferably be obtained by way of borrowing from the LLP’s bank but it goes on to say that if the members agree to make loans, then those loans will be in the same proportions as their contributions of the initial capital. There are also some basic terms with regard to repayment and interest. In practice, if the members do make loans to the LLP, it is advisable to have a formal agreement which sets out the terms upon which the loan will be repaid, when interest will be payable etc. Clause 4.5 should be inserted if there is any likelihood that the members are going to be required to provide any personal guarantees. This clause specifies how profits and losses of the LLP will be shared between the members. Usually, this will be in the same proportion as the capital contributions. This is not always the case: please see the two alternate wordings in square brackets. Clause 5.2 briefly explains how profits and losses will be arrived at in the annual accounts. It is common for members to be able to draw what amounts to a salary on account of their share of profits. Clause 6.1 sets out the initial monthly drawings. Clauses 6.2 and 6.3 deal with the possibility of either there being insufficient funds in the bank account or for a situation where drawings over the course of the year exceed the share of profits to which a member is entitled. In each case, any overdrawn amount must be repaid promptly together with interest. So far as expenses are concerned, partnership agreements quite often contain specific provisions dealing with permitted expenses and those expenses which are to be borne by the members individually and not treated as expenses of the LLP. Clauses 6.4 and 6.5 contain sample clauses to cover such matters. Clause 6.6 requires appropriate receipts or vouchers to be provided by a member claiming expenses. This Clause deals with the arrangements for meetings and the decision making process. In a small LLP, it is not uncommon for everything to be decided by agreement but that it not always the case – routine day to day matters may be entrusted to individual members. Clauses 7.1 and 7.2 deal with the frequency of meetings and the right of a member to convene a meeting at any time. Clause 7.3 refers to an annual business plan and budget. Once this is agreed, individual members may have some flexibility to operate within the approved budget. Clauses 7.4 to 7.7 deal with the conduct of meetings including quorum and voting rights of members. Clause 7.8 contains a list of those matters on which all the members must agree before a decision is made. The list is indicative and may need to be adjusted. Clause 7.9 requires minutes of the LLP meetings to be prepared and clause 7.10 makes it clear that decisions can be made without a meeting if confirmed in writing by the members. This Clause contains certain obligations on each member to devote his whole time and attention to the business and to act in good faith in all dealings etc. These obligations are owed to the LLP. Where a member is only involved on a part-time basis, this needs to be made clear in the LLP agreement. Under clause 8.2, there are certain restrictions on each member which are designed to protect the LLP. Under clause 8.3, each member is indemnified by the LLP against any claim arising subject to that member having performed his duties properly. This Clause should give the individual members some protection against third party claims which are made against them rather than against the LLP. Clause 8.4 sets out an indemnity in similar terms to clause 8.3 to be provided by individual members both to other members and the LLP to provide protection in the event that an individual member’s breach of clause 8 causes other members or the LLP any loss. The name and address of the Bank should be inserted in clause 9.1. Under clause 9.2, it is assumed that two members should sign cheques except for amounts below an agreed threshold figure when one signature is enough. This clause requires proper books to be kept and for annual accounts to be prepared. This is also a statutory requirement. As already mentioned, annual accounts have to be filed at Companies House where they will be open to public inspection. This sets out the holiday entitlement and rights to maternity/paternity/adoption leave (details to be agreed by the members) of each member. If the members wish to include additional provisions – e.g. for study leave or sabbatical, these matters should be covered here. It is usual for a business to maintain insurance of the premises and assets, as set out in clause 12.1. Under clause 12.2, there is a list of some of the more frequently applied insurances which the LLP may wish to maintain. This list needs to be tailored to the relevant requirements. Under clause 13.1 a member has the right to retire on 6 months notice, unless this becomes necessary for medical reasons. It is usually easier for a voluntary retirement to occur at the end of an accounting year and this is covered in the clause. A compulsory retirement age is covered under clause 13.2. Careful thought needs to be given to the selection of a compulsory retirement age as the LLP may face a claim for age discrimination. As a general rule, due to age discrimination legislation, we do not advise opting for a compulsory retirement age under 65. This sets out the grounds upon which a member can be expelled from the LLP. It is worth mentioning here that even if a member commits a breach which justifies expulsion, the other members do not have to give notice to expel the member in default and they might prefer not to. They nonetheless have the right to do so. On the death, retirement or expulsion of a member, clause 15 sets out the procedure to be adopted. Accounts are to be prepared up to the date of death, retirement or expulsion and clause 15.2 provides for the former member (or his estate) to receive any undrawn profits which are due to him together with any outstanding loans made by the member to the LLP. As will be seen, profits are payable within 6 months from the retirement date. These periods may need to be adjusted depending upon the circumstances. Clause 15.6 makes it clear that any rights which either member has are not removed by expulsion – for example, if a member is expelled for some material breach, there is nothing to prevent the continuing member from suing him for that breach. Also, under clause 15.7 it is clear that the outgoing member remains responsible for his share of income tax on profits and for any liability or claim which might arise after his departure and which is due to some fault on his part. Under clause 16, the members who remain following the death, retirement or expulsion of a member are given the right to acquire the former member’s share in the LLP. The clause provides for the remaining members to buy the share of the former member at an agreed price or failing agreement, the price will be fixed by a firm of accountants. Sometimes it is preferred to write such a clause so as to give the remaining members an option rather than an automatic right to acquire a former member’s share. In the case of a death, there are tax reasons – on the death of a member, business property relief (BPR) will not apply if there is an automatic transfer of the deceased member’s shares of the survivors. Advice form accountants is recommended here. From the point of view of the outgoing member, he will want some certainty that he is going to be bought out – especially on retirement. Clause 16.2 provides for payment to be made within a specified period. Responsibility will be shared on a pro rata basis by the remaining members. Under clause 16.3, the outgoing member’s liability for tax from his share of profits and any liability which is due to some fault on his part are dealt with. Accounting advice is recommended on this and other financial aspects of the agreement. If a member dies or retires, the others may decide that they would prefer to wind up the LLP rather than exercise the option to take over his share and this is dealt with in clause 17. It is usual for someone who leaves an LLP to be restricted from taking business or soliciting customers of his former firm. Legal advice should be obtained as a restriction which is too widely drafted may well be unenforceable. Limiting the period of the restriction and confining it to a relevant geographical area can help to ensure its enforceability. It is important to remember that there is no “rule of thumb” as to what will constitute a reasonable and therefore enforceable restriction: this will depend (amongst other factors) on the type of business carried on by the LLP, its size and the local market for services/goods of a similar type provided by the LLP. This Clause poses confidentiality obligations on both members and under clause 18.2, the confidentiality obligations will continue after the LLP ceases to exist. Members may choose to limit this obligation to a fixed term of years after dissolution. This clause contains fairly standard provisions with regard to the service of notices – they must be in writing and delivered either by hand or by recorded delivery mail. Under this clause, if a dispute arises, the parties must first of all try to resolve it amicably. Mediation can sometimes be a way of resolving disputes and clause 20.2 deals with this. Clause 20.3 gives the choice of either arbitration or the courts for the final determination of any dispute and clause 21.4 makes it clear that the agreement is governed by English law. These Clauses, known to lawyers as “boiler plate” clauses, make it clear, first, that this agreement does not give any rights to third parties, secondly it supersedes any other agreement, thirdly that if anything in the agreement is invalid or unenforceable, the rest of the agreement is unaffected and, fourth, if one of the parties does not exercise its rights to do something – e.g. to expel another from membership of the LLP – that will not prevent it from exercising that right on another occasion. Under English law it is common for a partnership agreement to be executed as a deed rather than simply signed by each party. For more information on deeds, see our accompanying Notes on Signing Agreements and Contracts. Note for Users: All square brackets should be removed and all gaps filled in or adjusted as appropriate before using this template. Any wording in italics should be replaced with appropriate wording in ordinary script. Also, where we have offered alternative wording, be sure to leave in only the alternative that you have selected.